A new year means a new you! And we want to help you create/maintain that. We are excited to share some news with you about things that will be new with TFC in 2016! 1) Our normal meal plans, which are available to any TFC Boot Camp member, have only been published once per year for the past few years. Beginning in 2016, we will release a new meal plan each quarter, starting January 1, 2016. This means that you will receive four different meal plans each year. 2) Many of you have asked for flexibility and the option of attending classes other than your "home camp." Sometimes you can't make your normal class time/location and would like to attend a different camp. Others have told us they'd like to be able to get in more than 3 workouts with TFC each week. Well, we are happy to say that we are accommodating those requests! 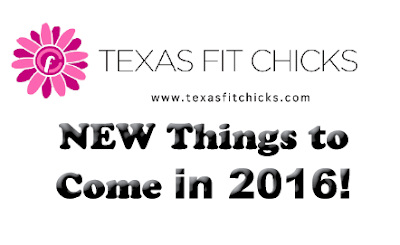 Beginning in January, Chicks who are on the $99, $129 or $159 plans will have up to 8 "extra" classes they can take per month. They will have a card they can print out and have their personal trainer at their "home camp," sign and date, and they will then have up to 8 workouts they can attend at any other camp within a one-month time frame. Each month, if they are in the $99, $129 or $159 plan, they will be able to print off a new card and get another 8 extra classes. If a Chick who is on the $79 plan would like to upgrade to the $99 plan before completing her 12 month term on the $79 plan, she may do so by informing her trainer, who will then let our Support Manager know. The Chick will then be eligible to receive the 8 "extra" class card, and on the date of her next draft she will be switched to the $99 plan and have a new, six-month commitment. On Jan 1, all of you on the $159, $129 or $99 plan will receive, via email, a card you can print off, which includes room for your trainer's signature, a date, and 8 blank boxes. Beginning January 1, each time you sign up for or renew for a camp (this does not include drop in purchases), the email thanking you for signing up will include the card that you can print. You will still have your personal trainer and your "home camp." If you want to be able to attend classes outside of your normal camp days and times you will bring a card to your personal trainer and have her sign and date it. Please be sure to contact another trainer before you just show up at a class other than your own. All class days/times and trainer contact information can be found on our website. Then you will present your card when you arrive. The trainer will simply sign her name and put a date in one of the 8 boxes and let you work out. Each month, you can print off a new card and take it to your personal trainer to sign and date it. If you present a card that has a date that is more than one month prior, you will politely be told you need to get a new card signed by your regular trainer. If you lose your card and can't find the document that was emailed to you, you can just request a card from your trainer and have her sign and date it. 3) Our $79 annual plan was introduced for a limited time in the spring, and we are continuing it through Dec 31st, 2015. Beginning January 1, it will no longer be offered to new clients. All new clients will have the option of signing up for our normal 3 plans which we have had the past few years - the $99, $129 and $159 plans. We truly appreciate our clients' referrals. We want to continue to show our appreciation to you for that, therefore, we are enhancing our referral program! For any current clients who wish to renew on the $79 plan, they will have the option do to so ONLY IF they have referred a friend who has signed up within the previous six months (the six months immediately preceding their renewal date). In other words, if a Chick is set to renew April 1, 2016, when she goes in to renew the system will check to see whether another client has entered her ID as a referrer since September 1, 2016. If so, the renewing Chick will see an option to renew at $79 for twelve months. The normal $25 referral credit will also apply. If you haven't already taken advantage of this option by referring a friend to TFC, you can do so between now and your renewal period. Be sure to give your friend(s) your TFC ID and they use it when they sign up for ANY TFC location. If they do not enter your ID the system will not know you referred the person and we will not be able to later go back and verify your referral. We are grateful to have you all as TFC Chicks and we thank you for the opportunity to help you along your health and fitness journey! 2016 will be a great year! 1. Do I have to refer a friend to the class that I'm currently in? Or can I refer a friend to any TFC class? Any referrals count, regardless of where your friend is located. 2. If I'm currently on the $99, $129 or $159 plan and refer a friend, will I also have the option to renew at $79? Yes, any current client who has had a referral within the six months prior to her renewal date will see the $79 option. Please keep in mind that in moving to the $79 plan you would not have the option for 8 extra classes per month. 3. What if I refer someone but they do not enter my ID when they sign up? The system will not know about your referral and you will not see the $79 option. If you are referring a friend and want to get the $25 credit and/or have the $79 renewal option BE SURE YOUR FRIEND TAKES THE TIME TO ENTER YOUR ID. 4. If I'm on the $99, $129 or $159 and have the extra class card, what if I want to drop into 2 classes one week, but then get in 3 three classes the next week? Is that allowed? 5. Am I allowed to "gift" my extra, unused classes to friends who are not with TFC? No, but keep in mind anyone can try a class for the first time at no charge. 6. Do the "unused additional classes" rollover to the next month? No, you'll need a new card signed by your trainer each month and only that current card can be used.